In addition to a special offer for employees at UNMC, UNO, Creighton and Clarkson colleges, The Conrad also is a premier choice for employees at Kiewit. 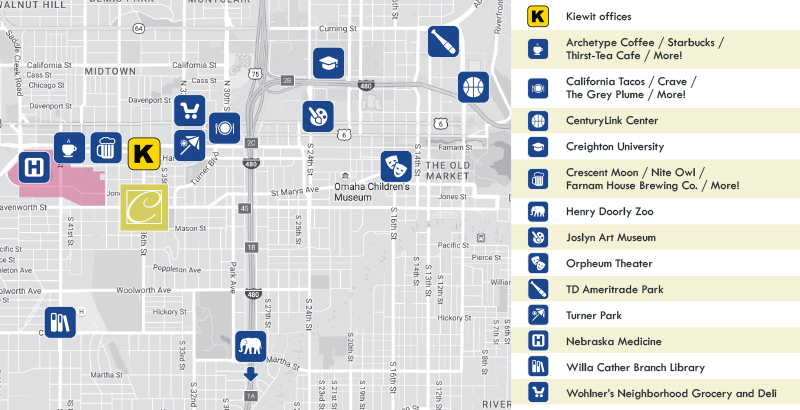 Located only three blocks from the Kiewit offices, The Conrad is a top choice for many Kiewit employees who want to live in the hip and historic Midtown / Blackstone District in Omaha. Special pricing for Kiewit employees! Kiewit employees SAVE $150 off your first full month's rent! Located near 36th & Leavenworth, The Conrad is perfectly situated for both work and play! In our neighborhood, you'll find locally owned specialty coffee shops, breweries and restaurants that provide a unique culinary experience. You'll also find friendly hangouts, great nightlife and great local boutiques and shops. Enjoy life at The Conrad. What’s not to love? Save time and gas commuting across town. Living at The Conrad means you're only a few blocks away from your office at Kiewit!